Cow's milk and soy milk both provide a tasty beverage and something to pour over your cereal, but they're nutritionally quite different One has no calcium, the other is full of cholesterol. Both have their up sides and their flaws. To choose the best one for you, compare their nutritional value and their health benefits to your needs. Soy milk contains no dairy products. 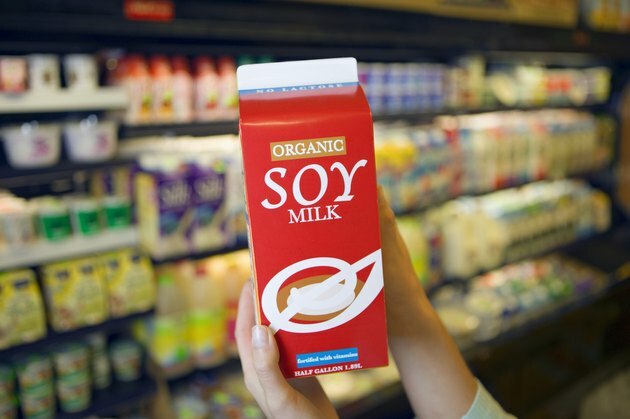 Manufacturers crush soybeans to make soy milk, a beverage that combines protein, water and oil. A serving size of one cup of soy milk provides 5 g of total fat, 4 g of carbohydrates and 80 calories. It contains 30 mg of sodium and 7 g of protein. At 6 percent of daily value per serving, soy milk is rich in vitamin B-6, and has 10 percent magnesium, phosphorous and riboflavin, and 25 percent of your daily thiamin. With soy beans containing more protein than any other legume, soy milk is high in protein. Protein helps the growth and maintenance of your body tissues, including your organs and muscles. The U.S. Food and Drug Administration said in 2009 that as part of a diet low in saturated fat and cholesterol, 25 g of soy protein daily can decrease cholesterol, thereby reducing the chances of heart disease. Because it contains no dairy, lactose intolerant people can drink it. And unlike cow milk, soy milk is low in saturated fat, contains almost no cholesterol and has 10 percent of daily value of dietary fiber -- a plus for your digestive system -- and 8 percent of iron -- an essential mineral needed for oxygen to travel throughout your body. Soybeans also contain omega-3 fatty acids, which can help reduce lipid levels. Whole milk contains 10 g of carbohydrates, and 5 g of saturated fat which is about 25 percent of your daily value based on a 2,000 calorie diet. It has 10 percent of the daily value for cholesterol or 35 mg, 125 mg of sodium and 8 g of protein. There is no dietary fiber in a cup of whole milk. Unlike soy milk, cow's milk contains 30 percent of the daily value of calcium, a supporter of teeth and bone health. It also has 25 percent of the vitamin D, a vitamin that maintains the health of your skin. It possesses even more protein and phosphorous -- another plus for bones and teeth -- than soy milk does. If you're watching your cholesterol, you can always switch to skim milk or low fat milk, as they have less cholesterol but the same benefits of calcium. Harvard School of Public Health stated that both dairy and calcium may help to reduce colon cancer and osteoporosis. The National Milk Producers Federation announced that the 2010 Dietary Guidelines for Americans recommends that adults and children above the age of 9 drink three servings of low fat milk daily.